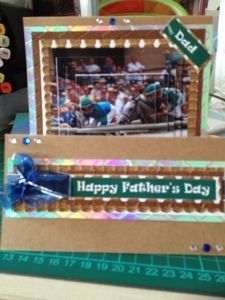 I have made this card for my father in law as he love's horse racing. The card is papermania. 6"x6" stepper card. I used Mirri card and brown coordinations card stock and embossed them using a darice folder from crafters companion. And the horse racing image is from craftsuprint. And I used gems and a blue ribbon to finish off.